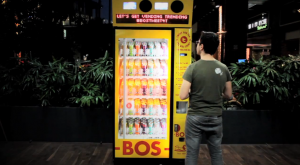 This fantastic vending machine is from South African brand BOS Ice Tea, who have initiated this Tweet-activated vending machine in Cape Town. Users simply have to tweet with the hashtag #BOSTWEET4T, and BAM, a free ice-tea is vended almost immediately. This is an innovative and clever way of integrating the digital and psychical world’s of advertising. The vending machine was made possible thanks to Cow Africa. BOS Ice Tea have created a unique experience were consumers are able to interact with their brand in a fun and engaging manner. Any potential clients want to create an innovative vending machine? talk to us.